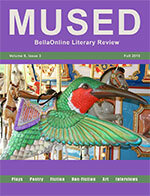 The Autumn Equinox issue of Mused is now live. This is the final issue of our eighth full year! It’s just stunning. This next Winter issue will be the first of our ninth season!! Thank you all so much for your support. The issue is spectacular. There are just amazing stories and poems in this. It is heartwarming how many high quality artists trust us with their works. We would love to hear your thoughts on it – and we would love to see your submissions for the upcoming Winter issue! Share the news!